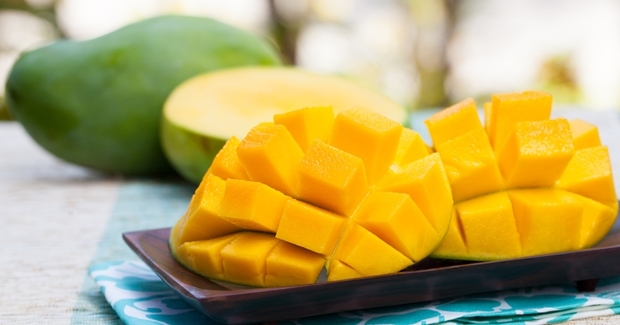 Mangoes are the most popular fresh fruit in the world. Not only is it an admired global alkaline fruit, but according to scientific evidence, mangoes are also a powerful medicinal food that contain many health benefits. According to the Federation of American Societies for Experimental Biology (FASEB), consuming mangoes every day can help lower blood sugar levels, despite their natural sugar content. In their study, scientist ran test on a group of obese animals, where some were given 10 grams of freeze-dried mango every day for three months. At the end of 12 weeks, the researchers tested the blood sugar levels of the animals that ate the mango and compared the data to the animals that didn’t consume the fruit. The results showed the animals that consumed the mango had a significant decline in their blood sugar levels. “Although the mechanism by which mango exerts its effects warrants further investigation, we do know that mangoes contain a complex mixture of polyphenolic compounds,” says Dr. Edralin Lucas, Ph.D., author of the study. Researchers from an Oklahoma State University study, also found that mango consumption helps to lower insulin resistance and improve glucose tolerance. This study was done on mice where they saw similar results to FASEB’s conclusion. Another study conducted Australia, found that consuming mango can also help decrease inflammation that result in high cholesterol, as well as block the formation of illnesses associated with metabolic syndrome. Previous ArticlePHARMACISTS IN SHOCK: A Recipe for a Homemade Cream That Wipes Wrinkles and Acne Away Just like an Eraser!